By reading this article you can learn how the micro-blogging sites (facebook, twitter..etc) displaying the date of an Article or Post in user's perspective. 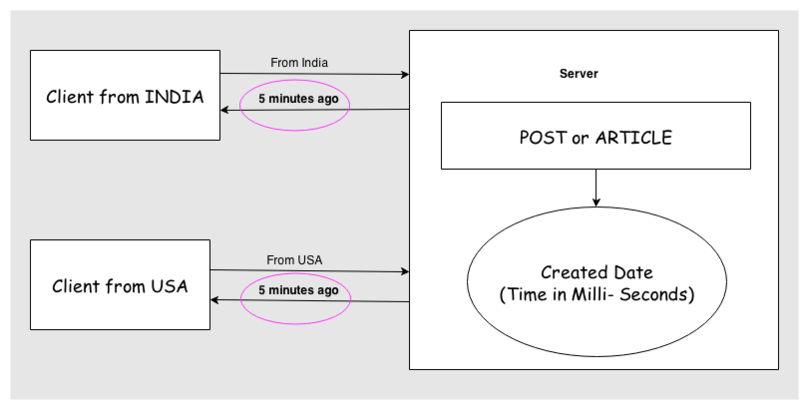 If any one posted a story in facebook, any user from any time zone should see the same time difference-message like "5 minutes ago" or "1 hour ago" or "yesterday" or "last month"..etc. Get Client's "Locale" object by HttpServletRequest. Generate Calendar object by using that Locale object. Now get Calender object for posted time of an article. Here "millis" is article posted time in milli seconds.